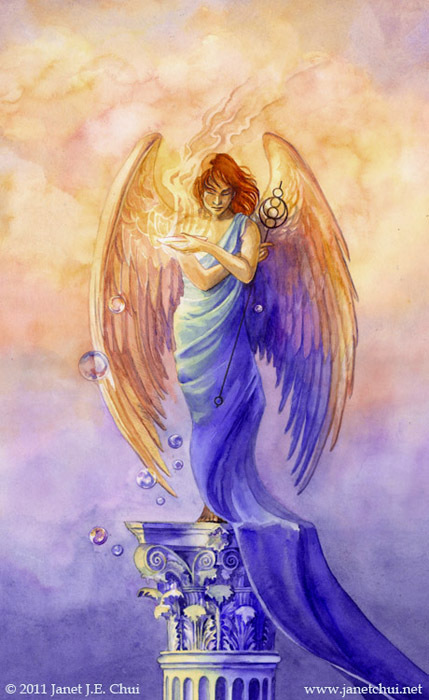 The Angel of Truth and Illusion. Watercolours, 2011. All rights reserved. I’m now a decade-and-a-half removed from my college years. American college was very different from my one year in a Singaporean university: I was unlimited in the classes I could take (barring costs), and I exercised that freedom, covering astronomy, art, art history, writing classes in both creative and journalistic stripes, and philosophy. The philosophy class that covered the history of philosophy was a journey of discovering that humankind actually knows very little for certain. (I write that with a grin.) After I graduated, the journey of questioning knowledge/reality continued as I became Buddhist and found myself reading texts about emptiness and dependent arising. Here’s what we can know: All our human experience comes to us through our senses. Some Buddhist texts lead you through the implications of this: the miniscule but undeniable time delay between external phenomena and our reception of it into our awareness means we never perceive “reality”; we only perceive what our senses allow us to perceive, while our brain interprets. What most people think of as reality is merely shared perception as allowed by our normal human senses. Dependent arising is the Buddhist concept that highlights that our perception is not separate from the object of our perception. We are all made of the same dream and same illusion. Many examples go like this: A table is a table because you perceive and label it as a table. It exists in your “reality” because you exist in the same one–a world in which both you and the table are physical and in which you believe you are a separate thing from the table. This idea is profound and almost universally translatable into philosophical discussions, or quantum physics, or New Age explanation/channeled writing about different dimensional levels. Whether or not you are into those subjects, it also has practical application–that everything we think we know is up for question. To explain this further: It is imminently useful to question everything that holds us back from our full potential: programming and limiting beliefs from childhood/societal indoctrination (eg. “don’t go against the grain”), limits on human ability/science (“clairvoyance/action-at-distance/free energy doesn’t exist”), cynicism (“all people operate on selfishness”), and material reductionism (“anything that cannot be seen or measured by an instrument does not exist”). The last one is especially ridiculous considering science is continually advancing in what it can measure and understand; and obviously atoms and smaller particles have always existed even before the instruments capable of magnifying them were invented. Anything that anyone exerts as true in their experience is only true for them and in that instance of time. It is not reality. It is merely their experience of it. 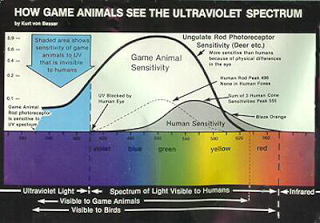 The “reality” that animals perceive is different from a human’s. Likewise, the colours most guys can identify are different from what most women (and designers) can. This is easily demonstrable especially while home-decorating. Know then, that everything that you think you know about how the world/reality works is ultimately in your head, based on your experience (and limited to what your senses let you experience) and/or what has been taught to you in school, or, if you’re the curious type, your research. Both first and second hand information is ultimately filtered sensory input, and processed by your brain according to how your brain has been programmed–it’s NOT reality. 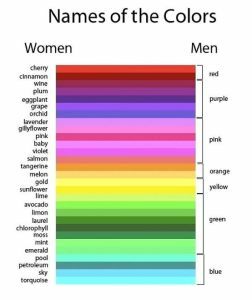 The fact that some people are colour blind, whether technically by birth, or chosen don’t-give-a-damnedness (like with different yellows) demonstrates that sensory sensitivity is a product of both nature and nurture. Anyone who works in the culinary arts, perfumery, visual arts, etc., knows this deeply; one’s performance in those fields depends very much on developing those senses and sensitivity, which in turn determine one’s quality of work. Extend this, if you will, to yogis, mystics, and advanced meditators who have trained their abilities to work with subtle energies and thoughts. It is the height of arrogance and egoccentricity to say that because one lacks equal sensitivity needed for certain abilities, all subtleties and differences that are picked up by others’ more developed senses do not exist. They are simply undetectable at that point in time by the clod. Not only can what is discernable by the senses differ from individual to individual, but beliefs shape what is perceived. Cadmium yellow may be filed as simply “yellow” by non-artists; a sudden cold chill in a warm room will mean something different to someone who is open to “supernatural” phenomena and anomalies, vs someone who denies them all vehemently. Denial, strangely enough, is something that requires more energy to maintain, vs pure observation that leaves options and conclusions open. If both parties agree on the presence of the cold spot, a denialist will still reach for a “reasonable” physical explanation (no matter how unlikely) while an open mind can accept that mainstream science can’t yet explain everything, and maybe unseen presences/energies are possible. Still, neither view is reality. They are merely two viewpoints. The “skeptic” or denialist’s model of reality precludes a supernatural event, while the “believer” allows one. Bring a clairvoyant or medium into the room to observe, and you’ll have yet another model of reality, likely expanded with more (extra-)sensory input. All models are equally valid (or invalid), in the meaning of “to each his own”. Experiences are individual, and to argue that anyone’s experience is more “wrong” than another’s is a waste of time–which doesn’t prevent such tedious discussions from happening all over the Internet. The tedium is most pronounced from individuals who insist that their model of reality = reality. Many of these assert that their model of reality = consensus reality = reality. It is boorish, it is limiting, and it is ego-based. It is a turning point, perhaps a waking point, to realise that reality, for all of us, is filtered through our senses and the sensitivities available to us, and our models of reality are constructed upon this information and our open-mindedness. Ego, however, can jam up the machinery and hamper this realisation. Particularly with the psychology of “sunk costs”. If your career (particularly for scientists), reputation, faith and/or pride (ie. ego) can be jeopardised on realising that a long-held belief or your model of reality appears lacking in the face of new evidence/another model, cognitive dissonance/denial is the ego’s reaction. One can go so far as to funnel one’s energy into rationalising unlikelier and unlikelier old-science explanations for truly “inexplicable” phenomena, or denying those observations outright. In the age of information, it is easier than ever before to learn of other people’s viewpoints and explanations on “how it all works”, and even try on their models for size without attachment. Remember again that none of these models of reality are reality, they are all filtered or distorted by senses, prevailing cultural lenses, and individual beliefs. Scientists’ models too can be distorted and limited, such as by recording data only within a certain spectrum of observable phenomena, the discarding of outlying results, the relationships drawn between observations, and even (as has been found in experiments on light) what we expect to see. Reality is in fact a fluid and elusive thing. Any insistence along the lines of “this (model) is how it really is and will always be” is futile. None of us know reality for certain. We are all just experiencing it distorted through different filters and adopting models (some more consciously than others) to explain our experiences the best we know. To recognise this is to seize the power of determining what we want to see and work with. Sensitivity in any of our available senses can be developed with focus and practice. It applies to gastronomy and the visual arts as much as to the detection of subtle energies by learning tai chi, kung fu, meditation and/or some form of energy healing. Before meditation brings awareness of subtle energies, it does train someone to be aware of their own thoughts, and, with more practice, to direct/quieten their thoughts and sit with pure awareness. This awareness combined with the realisation that all experiences of reality are mere models, helps us take control of our experiences. Everything is a choice. It is a choice to believe in a merely mechanical and materialistic universe, just as it is a choice for someone else to believe in a “magical” one. If we recognise that these are choices, and that they are choices available to everyone, and if we can CEASE JUDGEMENT on ourselves and others for the choices we make, we free ourselves to make the choices that make us happy and that work for us without cognitive dissonance. We can keep these models until we are presented with another opportunity to make a different choice. We can ditch others’ expectations and try how “bad” it is to go our own way and to change our minds. We can ditch religion and embrace spirituality. We can ditch all the gurus and become our own. We can ditch the past and past programming and focus on now. We can stop fighting for or against creationism vs evolution, science vs “pseudo-science”, and all false opposites. If we continue arguing about what “reality” is, when in fact we’re just arguing over models, we remain trapped in those models we are allowed to accept by society/experts/control systems. We limit ourselves in those traps, and in turn become limited in what we believe we can experience AND control. We become victims, robots or mere digits in an game of economics and survival, distracted by minutiae, and making ourselves miserable, but gamely continuing to hand our money and powers to others on high, crying that we can’t make a difference, when we can actually start anytime by questioning the illusion. This is a game. It’s not an easy one, and it’s not a game in which we have had the rules explained to us, but we are in a shared dream in which those of us who believe in “magic”, our own divinity, and an unseen side of reality give ourselves more to work with than those who do not. Those who poo-poo magic/energy work/the power of faith make that choice and will reap the results, likewise for those who embrace “alternate” models of reality, even if the benefits are “only” emotional or psychosomatic as viewed by others. Whatever choices we make should not step on the rights and freedoms of another. You’re always free to mock other choices, but an obsession in putting down others frequently indicates insecurity in oneself, self-rejection, and/or shadow projection. And to believe in one’s model of reality AS THE ONLY REAL AND TRUE REALITY AND ALL IT CAN EVER BE is to deceive oneself and diminish what is possible. Anything that is demonised or diminished in the media and by the status quo should be questioned. It is a set-up for division, separation and perpetuating the illusion that reality can be fought over and pinned down; that only one view is right. The illusion that we are separate and in need of external powers to save us from ourselves is currently the “winning” model, and it will stay that way so long as no one questions, and as long as the powers-that-be benefit (and boy do they benefit) keeping that model in place as “reality” for most people. Ego wants reality to fit inside neat-and-easy models of reality. 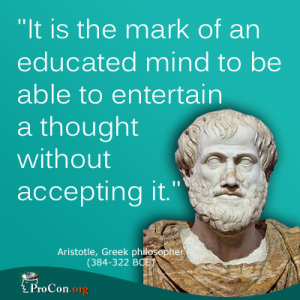 Ego wants assurance, logic, rationality. The world has to make sense the way I say it should, says the ego, then I am comfortable. The aware and awakened mind has no such attachment. And meanwhile, the heart wants what it wants and has its own dreams. It is, for all intents and purposes, its own sense and its own brain. Those who work holistically with the body know that EVERY CELL of the body is capable of sensing; and the heart organ, and heart chakra are capable of more than most people know. The heart craves connection, community, cooperation. It exists to give love regardless of rationale; it is the mind and ego that restricts the heart’s generosity. No true altruism or compassion is born in the mind–that is the domain of the heart, and most of us are still to discover what we are capable of when our consciousness is seated there. The world would be a vastly different place if we all tried it. It still can be. The heart, when given rein to create its model of reality, has abilities that outstrip using the mind alone. That will be a subject for a separate post.